Assisted mountain activities as part of your holiday can enhance your life or that of someone you know. Every child loves playing with a bow and arrow (even the grown-ups!) so why not have a go at Archery. It is a paralympic sport so you never know a budding Olympian could be hiding in your family…. 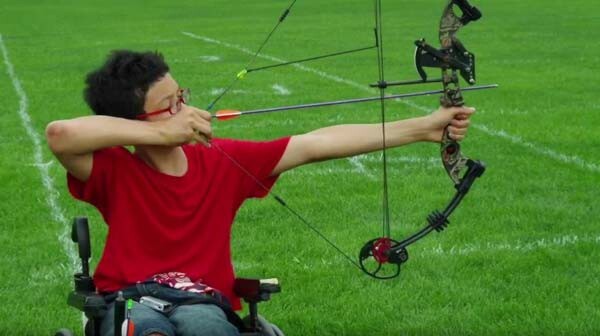 Archery is a sport accessible to just about everyone with a disability, including the visually impaired. While it is not only fun to challenge yourself to hitting the target, it’s also physically beneficial, increasing body strength, focus, flexibility, and attention skills. Although we know that many of the ski resorts during the summer offer archery as an activity what we doing now is researching to see if they can do this for blind or visually impaired visitors. Our 'library’ of comprehensive information on which ski resort or mountain location is suitable for you, whether in France, Italy, Switzerland, Austria, Australia, Sweden…. is waiting for you to dip into and we are here to help find that perfect ski or summer holiday including wheelchair accessible accommodation. If you don’t find what you are looking for or need advice and reassurance then do contact us.